Today is the day when we open up that dusty photo album and tell you stories from the past: we decided to introduce you to the whole Silent Family, all the members and the lineup since the beginning. Some of them played key roles on our album RISE! As you know, Silent Saga is the sucessor of Brazilian Act Amazon. 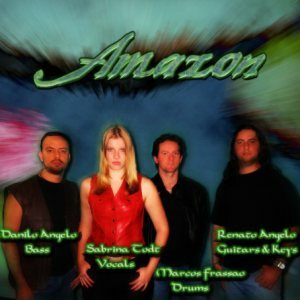 Amazon was founded in 2002 by Sabrina and Renato back in a town called Valinhos, somewhere near São Paulo, in Brazil. Here’s an awesome (uhhh… no) band picture from the lineup back then. Marcos is a very good friend of us and the drummer you hear on the songs on our album RISE!. We look forward to hitting the stage together again some time in the future! He lives in Brazil, and is breaking all standards with his band Kadabra. If you haven’t checked them out yet, you can do it HERE. 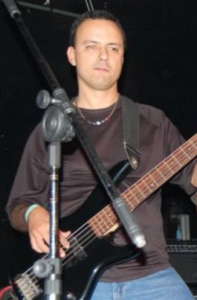 Danilo, the former bassist, is Renato’s brother. You might recognize the name from the lyrics of the songs “Immortal“, “Three Lives” and “Bittersweet” on Silent Saga’s album Rise. Although Danilo left the band back in 2011 for personal reasons, he still writes lyrics and parts of songs for us. When Danilo left the band, his good friend (and ours too, as a matter of fact) Newton joined us. We had a short but awesome time together. Newton is an outstanding musician, both on bass and on acoustic guitar, and a really nice dude! But as we all know, life happens and Newton received an irrefusable offer to move abroad, and again we needed to find a bass player. Luckily for us, we had quite a few good contacts, and we soon welcomed another great bass player: Andre Pedral. Andre is the man behind the bass lines recorded on our album Rise! and an extremely talented multi-instrumentist. He also lives in Brazil and has multiple music related projects. When Sabrina and Renato moved to Germany, they decided to rebrand the band – for obvious reasons. And Silent Saga was the chosen name! Already in Germany, Sabrina and Renato invited Alex and Daniel Sapcu to join the European line-up. In the first half of 2018, Alex left the project and Hamburg’s legendary bassist Carsten Meyer joined, leading to Silent Saga as you know it. But the Saga hasn’t come to an end yet, and many more years are to come! Right now we are working on new songs and producing a new EP, which will be released before the end of the year! Are you interested? Then sign up to our VIP Subscribers list and stay up to date with all details!